FQ: Let us begin with Missy. Can you tell readers a bit about how Andromeda and Missy came to fruition? Was it a goal of yours to reach readers in a way that would perhaps brighten their lives in a world that is currently leaning toward the pessimistic? CRAWFORD: Absolutely! I feel like one of my main purposes is to brighten up an otherwise pessimistic world with my stories. I’ve wanted to write about something that takes places in Western Kansas ever since my husband – a former Kansas farmboy – took me there; I met his wonderfully charming relatives and fell in love with the land. I’m from the East Coast and lived on the West Coast for most of my adult life. When I tell people I lived in Kansas, their eyes glaze over…like I’m sure mine did at one point. I wanted to show these Kansas folks’ depth, sincerity, and wisdom – they’re definitely not the bunch of “hicks” so many may think. I heard a line from the movie Starman many years ago – something along the lines of “You humans are at your best when you’re at your worst.” I’ve wanted to create my own starbeing for decades and have to look through her eyes to see how beautiful we humans can be and how amazing life on Earth is. It was really fun to have to imagine taking a sip of water for the first time as well as the many other fun things humans engage in. FQ: You have written in a few genres – from romantic comedy to historical fantasy. If you had to pick one that you love the most, what would that be and why? If there is not a “favorite,” per se, is there a favorite character of yours that you feel a true affinity to above the others? CRAWFORD: The one thing all of my books have in common is that they’re inspirational. The main thrust of my stories is to have the shero shoulder awful events / marriages / circumstances and spin them into gold somehow. I also love love love writing about falling in love, so they involve a love story. My favorite books to write are romantic comedy but with a deeper message. 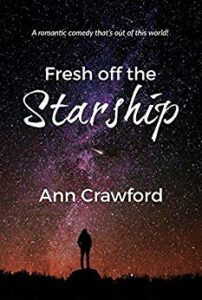 In between the chuckles in Fresh off the Starship, I talk about sexual abuse, drug addiction, PTSD in the Vietnam veterans, and other issues. Those PTSD events are true stories from some vets I’ve had the honor to know. In every book I write, I love to show how we – no matter how “ordinary” we may think we are – all are extraordinary or very special in one way or another. Missy’s already extraordinary (being a starbeing on Earth – on her own planet, she’s not quite so extraordinary), but she lost her training in her descent to earth. So she has to figure out the ways of these strange humans without letting on that she’s not who they think she is. These characters come to me and knock on the door of my consciousness and won’t leave me alone until I’ve written their story. I’m not even kidding! The best example of this is Catriona in Spellweaver...it was SO challenging to write a book about the witch hunts, and I tried to not write it, but I kept hearing her words of wisdom and light in my head—so I had to finish it, and I’m so happy I did. FQ: In your bio there is a line that states you “...believe in love at first sight, that good always prevails, and that we’re here for those wild-wonderful-way-out-there visions of ours to come alive.” Since you seem more than optimistic when it comes to life, how difficult is it to leave the abysmal, daily “headlines” in the dust? I do read the news (digitally) and listen to NPR almost every day, so those headlines are top of mind. But I really do believe that good prevails, that love triumphs, and that we’ll come through any adversity that we face, whether individually or as a collective. I definitely believe in love at first sight – it’s happened to me! I also believe that we’re all special and unique in our own ways and that we’re here to see whatever dreams we hold come to be. That’s one of the main reasons we’re here. FQ: Along those same lines, if there was one wrong in this world that you had the power to make right, what would that be and why? CRAWFORD: First I would feed every hungry person. Next I would abolish human trafficking* and slavery, where it still exists. I do believe that we will ultimately right the wrongs in politics and wars. Regarding what we’re doing to the environment and the animals. I would love to end trophy hunting, killing elephants for their ivory, poaching, and the like. I’d love to see us go with 100% renewable energy to stop polluting the air, water, and ground. That all would be a good start! *One of my last feats in my time in talent management was landing Alpa Banker her phenomenal role in Trafficked, which is a heart-wrenching but important film about human trafficking. I highly recommend this movie. It also stars Ashley Judd, Sean Patrick Flanery and Anne Archer. FQ: Can you tell readers a bit about your documentary filmmaking and how/why you decided to go into that industry? Can you tell us a bit about your current or upcoming projects in that arena? CRAWFORD: I was writing screenplays at the time; a friend recommended taking the film class she was in (to help with screenplay writing) and I absolutely fell in love with it! I used to do a lot of work for Amnesty International, and I ended up finding the Veterans Vietnam Restoration Project, and my first movie was documenting a trip they took. The purpose of their trips was threefold: to give something back to the country of Vietnam, to heal their wounds of war, and to (in the former Executive Director’s words) atone for what they may have done there. It was one of the honors of my lifetime to be with those men as they shed decades of guilt. Our team built an annex for a clinic that serves amputees – there are still land mines going off, unfortunately. That film won a very prestigious award. The next movie involved traveling around the world asking people from all walks of life how we can make peace. That journey was another honor of a lifetime. My heart is really with writing, though. I am turning several of my books into screenplays, and perhaps the movies will get made – but probably not by me. I’ll be writing more books! FQ: Give us a peek into an Ann Crawford Writing Day, if you will. Such as, do you work in a specific room, have music playing in the background while you write, the family dog at your side…? What is needed to make those ideas flow? CRAWFORD: I have a writing “nest” – a comfy sofa that faces out a window where I have a view of a grove of trees and a beautiful garden. I have a desk, too, but I never seem to write there. I put my laptop on a huge, thick cushion on my legs, and I’m more comfortable than at a desk plus my posture is better. I’ve written four books on that sofa. Oliver, our parrot, is right next to me enjoying the view, too, along with some neck scratches when I’m taking a break. I generally meditate right after breakfast and then write. I spend the afternoons doing things like marketing work (which can be endless) and recording audiobooks. I’m converting a couple of my books into screenplays, as I mentioned, and that sure takes a while. I do develop a new music playlist for every book…and after a little while it’s Pavlovian: as soon as I turn on the music, I’m in the world of the book. Even now, if I hear a song from the Angels on Overtime playlist, I’m back in the mountains of Idaho. FQ: In a writing world that encompasses a great deal of marketing via social media, can you tell us a bit about your foray into websites, Twitter, Facebook, etc. ; and how you use these paths to not only promote your books and talk to your fans, but also help others become humanitarians, such as yourself? Do you feel social media is a positive thing for the writing industry? CRAWFORD: I think social media is the greatest thing since sliced bread! I love being able to reach so many people and hear how my books have touched them. Publishing coaches actually advise people to skip the traditional bookstore tours and just do social media – i.e. blog tours and the like – these days. FQ: Everyone is always asking writers what advice they would give to new authors when it comes to making their writing better. If you could give a piece of advice to a writer just starting out on what NOT to do/or, what to avoid in order to make their career better, what would that be? CRAWFORD: Keep writing! Show up to, as the adage goes, “put the seat of the pants to the seat of the chair” at a pre-arranged, uninterruptable time every workday, and the book will get written. Even if you have only fifteen minutes a day, little by little a book can get done. Some writers are plotters, where they outline and pre-arrange the book before writing it. I’m definitely not one of them. I write whatever wants to be written that day and then tie those pieces together. For me the most important thing is being open to the music from the muse and the changes it might bring. I once said to a screenwriting professor that my writing surprises me sometimes. “You mean you say, ‘I can’t believe I just wrote that?’” she asked. The class laughed, and so did I. But…well…yes, I do mean that, LOL. FQ: What comes next in the Ann Crawford world? Can you speak about any titles that are coming out in 2019? CRAWFORD: I put out two books last year and I’m expecting the same for this year. One is called The Life of My Love, which is about finding the love of your life (something I’ve done very well!). The second book is about three generations of women: an aging hippie flower child, a bank executive, and a trans woman college student.